How much do Lions suites cost? Prices typically range from $9,000 -$18,000 for Detroit Lions suites. Prices vary based on opponent, day of the week, suite level and suite location. Luxury suite prices for concerts and other events at Ford Field can vary widely based on the type of event. Terrace Level suites are smaller private group suites that are connected by an upscale lounge serving food and beverage. 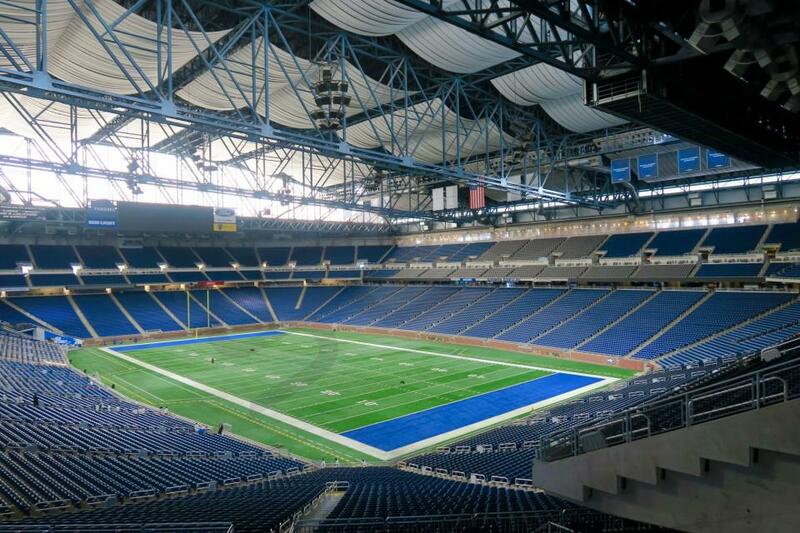 Terrace suites are located on the top level at Ford Field and offer brilliant views of the entire field. Detroit Lions luxury suites include premium in-suite catering options, HDTVs, a kitchen area and a dedicated suite attendant. With the purchase of a Lions suite you will get exclusive access to the bars and restaurants on the suite level. 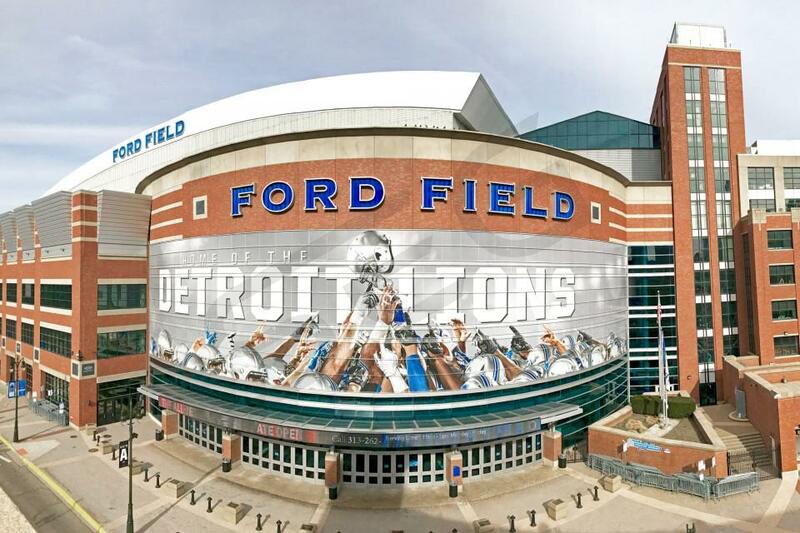 Your entire group will also get private entry into Ford Field. This Lions Club Level suite includes 14 tickets and 2 VIP parking passes. This Detroit Lions suite is located on the middle suite level. The luxury suite includes 24 tickets, 4 VIP parking passes and 4 pre-game field passes. In-suite catering can be purchased in advance. In the suite will be HDTVs, lounge seating, Wi-Fi, dining/entertaining space and a dedicated suite attendant. Up to 6 additional tickets can be purchased for the suite. This is the highest suite level at Ford Field and features great views of the field. Lions suites feature fine amenities such as high end seating and fixtures, HD TVs, and premium seating. Also included with your suite purchase are VIP parking passes and private VIP entry into the stadium. This section contains additional information, tips, and suggestions for planning or hosting an event at Ford Field. There are many options for entertaining larger groups at Ford Field. The stadium contains 5 suite levels, all of which are undergoing a complete renovation during the offseason in 2017. Suite capacity ranges widely from 5 person opera-style boxes to 50 person party suites. Most private luxury suites will accommodate 14-20 guests. The south side of the field has 3 full suite levels stacked on top of each other: the 400 level suites on the 4th floor, 500 level suites on the 5th floor, and 600 level suites on the 6th floor. These are the main suite sections in the stadium, and each of these levels contains 34 private luxury suites and larger party suites. There is another smaller suite section on the south side called the Club Level Suites. These suites are located below the 400 level suites, at the top of the 200 level seating sections. On the north side of the field there is one more suite section called the North Side Suites, and are located across from the 500 level suites on the south side. Costs for private suites at Ford Field vary depending on the suite type, suite location, matchup, event, and day of the week. Third-party events such as Monster Jam can sell for as low as $5,000 while Lions games typically range between $9,000 - $18,000. Cost does correlate to suite capacity as well, so smaller suites will cost less while party suites will cost more. Full catering options are available for all suite sections in the stadium. All suite catering is handled by Levy Restaurants, one of the largest restaurant and catering companies in America. Suite Experience Group can help you decide between catering options and will coordinate details for you. Our average client spends between $1,500 and $2,000 on in-suite catering. All suite ticket holders have access to the North Club and the Huntington (South) Club, which are both exclusive stadium clubs with high end dining and beverage options. Both of these clubs are open until an hour after all Lions games, so you and your guests can enjoy a bite or drink after the game. There is no special dress code in the luxury suites. Suite guest attire is similar to attire worn outside of the suites - some fans are dress casually while others are dressed in more business appropriate attire. Ford Field is enclosed, and all suites at Ford Field are climate controlled so it won't be too cold even during Michigan winters. Suites at Ford Field come with VIP Parking Passes which will grant you and your guests to prime parking at the Ford Field Parking Deck. There is a bridge directly to the stadium on the second floor of the deck which provides a cover in case there is inclement weather. If you have a larger group, bus drop off can be arranged - your Suite Experience Group representative will be happy to assist with coordination. The parking deck opens 3 hours before kickoff for Lions games, and the stadium gates and suites open 2 hours before kickoff. Suite guests may remain in their suites for up to an hour following the conclusion of the game or event. After falling just one game short of the playoffs in 2017, the Detroit Lions decided to switch head coaches in the off-season. Jim Caldwell will be replaced by Matt Patricia, the former defensive coordinator of the New England Patriots. Patricia, along with his new coaching staff, have already brought in an exciting new energy to the Lions locker room at Ford Field. Offensively, Matthew Stafford will look to build off another tremendous year in 2017. Last season he posted the best passer rating of his career and tied his career-best with just 10 interceptions thrown in a full season. Stafford’s primary targets will once again be Golden Tate and Marvin Jones Jr., who make up a solid 1-2 punch in the receiving corps. In the backfield a majority of carries will go to new addition LeGarrette Blount. Blount won a Super Bowl in 2016 with the New England Patriots and also in 2017 with the Philadelphia Eagles - will his magic carry over to the Lions in 2018? With a defensive background, Matt Patricia will look to improve a Lions defense that struggled at times last season. Outside linebacker Devon Kennard was signed to a multi-year deal in the off-season to bolster a defense currently led by secondary players Darius Slay and Glover Quin. Kennard comes to Detroit after spending the first four years of his career with the New York Giants. In 2018 the Detroit Lions and Ford Field will host games against the Green Bay Packers, Chicago Bears, Minnesota Vikings, Los Angeles Rams, Seattle Seahawks, Carolina Panthers, New York Jets, and New England Patriots. The Detroit Lions should again be a playoff-caliber team in 2017. Quarterback Matthew Stafford has established himself nicely among the top tier of NFL QB's. Stafford will have an improved offensive line protecting him this season. The additions of Guard TJ Lang and Tackle Ricky Wagner should pay immediate dividends. At the skilled positions, notable contributors are wide receiver's Golden Tate and Marvin Jones, and at running back, the Lions will rely on a tandem of Ameer Abdullah and Matt Asiata. The Lions focused heavily on defense in the 2017 NFL draft. First-round draft pick ILB Jarrad Davis should be an immediate starter for this defense. The Lions also drafted CB Teez Tabor in the second round. Other players to watch on defense will be CB Darius Slay, DE Ziggy Ansah and NG Haloti Ngata. Ansah will look to bounce back from a disappointing 2016 season. The year prior, Ansah was a Pro-Bowl pass rusher. In other news, the Lions will also be debuting brand new uniforms in 2017. 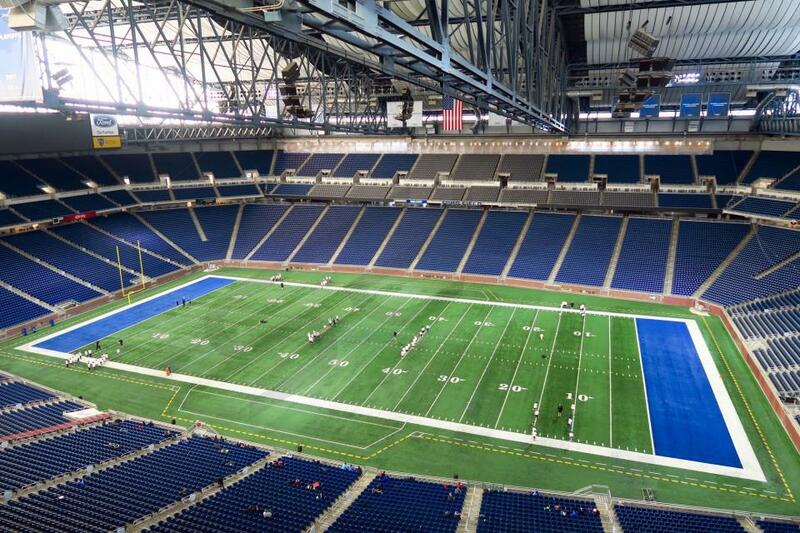 In the offseason, Ford Field's suite level underwent major renovations. Fans can experience Lions football from multiple suite levels and club spaces this year. The Lions 2017 home schedule will include: Arizona Cardinals, Atlanta Falcons, Carolina Panthers, Chicago Bears, Pittsburgh Steelers (Sunday Night Football), Cleveland Browns, Minnesota Vikings (Thanksgiving Day) and the Green Bay Packers (New Year's Eve). Offense: The Detroit Lions reeled off six wins in their last eight games providing some much needed optimism after a sluggish start to 2016. Unfortunately for the Lions, stud wide receiver Calvin Johnson retired in only his 9th season after having a great year. Calvin Johnson affectionately called Megatron finished with 88 receptions, 1214 receiving yards, 9 touchdowns and a multitude of highlight reel plays. It will be interesting to see how Megatron's retirement affects talented gunslinger Matthew Stafford who had another productive season in 2015. He once again finished with over 4,000 receiving yards and 30 touchdowns but will have to target other receivers like Golden Tate, the newly signed Marvin Jones and tight end Eric Ebron. Golden Tate has consistently been extremely effective throughout his NFL career and will likely have one of his biggest seasons yet in 2016 as the top target. UC Berkeley product Marvin jones has shown enough raw potential to make quarterbacks across the league very jealous of Matthew Stafford. The Lions two best running backs. Ameer Abdullah and Theo Riddick, both showed tons of potential last year as Abdullah tore up NFC North defenses on the ground while Theo Riddick came out of nowhere to finish as one of only two tailbacks to have 80 receptions on the year. The Lions first round draft pick Taylor Decker out of Ohio State is talented and will help to stabilize an offensive line that has the very important job of keeping Matthew Stafford safe. Head Coach and offensive guru Jim Caldwell certainly has a lot of weapons to work with this year. Defense: On the defensive side of the ball the Detroit Lions have a couple of stars to build around and can expect significant strides to made in team defense. Ezekiel aka "Ziggy" Ansah, Haloti Ngata and Darius Slay all have been extremely productive players in their NFL careers. Ansah perhaps has the most potential of any player in the NFL as he is blessed with a ridiculously athletic 6 foot 5 inch 280 pound frame. The young Ghanaian defensive end was named to the Pro Bowl in just his third season after posting an impressive 14.5 sacks, 4 forced fumbles and 47 tackles. Haloti Ngata has been one of the most powerful and productive defensive tackles in football since he was drafted by the Ravens in the 2006 draft. He is a monster at the point of attack and as an example of his unreal athleticism he can dunk a basketball while weighing 345 pounds. Darius Slay has grown into one of the best cornerbacks in the game and at only 25 years old he still has plenty of time to improve. According to Pro Football Focus Slay was the fourth best cornerback in the NFL last year. The most important thing for the Lions going forward is building around the three defensive stars to gain more consistency defensively. Schedule: In the 2016 preseason, the Lions will host the Pittsburg Steelers and Baltimore Ravens. In the regular season the Lions will host the Tennessee Titans, Philadelphia Eagles, Los Angeles Rams, Washington Redskins, Jacksonville Jaguars, Minnesota Vikings, Chicago Bears and Green Bay Packers. The game against the Vikings will be the traditional Thanksgiving Day game played at Ford Field. Suites and Special Events: The best place to watch the action at Ford Field is from a private luxury suite. A Lions luxury box provides fans with the ultimate VIP experience. Ford Field suites include premium in-suite catering options, leather seating, HDTVs, a kitchen area and a dedicated suite attendant. With the purchase of a Lions suite you will get exclusive access to the bars and restaurants on the suite level. A Lions suite will also provide your entire group with private entry into Ford Field. Being in a Detroit Lions luxury suite is an NFL experience you’ll never forget. Ford Field will host many non-NFL events in 2016 including Guns N Roses, Luke Bryan, and Kenny Chesney with Miranda Lambert. After making the playoffs in 2011, the Detroit Lions have struggled to make their way back to the postseason. The Lions finished 7-9 last season. To help turn their misfortunes around the team hired new head coach Jim Caldwell. The Lions should have no problem putting up points behind their offensive stars: Matthew Stafford, Calvin Johnson and Reggie Bush. The Lions also drafted a tight end in the first round of the draft, Eric Ebron. On the defensive side of the ball, the Lions have one of the better defensive lines led by Ndamukong Suh. They’re in a tough division, NFC North, and will face a tough schedule at home. Facing the Lions at Ford Field this season will be the New York Giants, Green Bay Packers, Buffalo Bills, New Orleans Saints, Miami Dolphins, Chicago Bears, Tampa Bay Buccaneers and Minnesota Vikings. You can watch the action on the field from a private luxury suite. A Lions luxury box provides fans with the ultimate VIP experience. Ford Field suites include premium in-suite catering options, leather seating, HDTVs, kitchen area and a dedicated suite attendant. With the purchase of a Lions suite you will get exclusive access to the bars and restaurants on the suite level. Your entire group will also get private entry into Ford Field. It’s an NFL experience you’ll never forget. Thank you for signing up for specials at Ford Field. Enter your email address below to stay in touch. We'll sign you up for our newsletter, which will inform you of the latest inventory and events at Ford Field. We promise we will never sell or distribute your information. 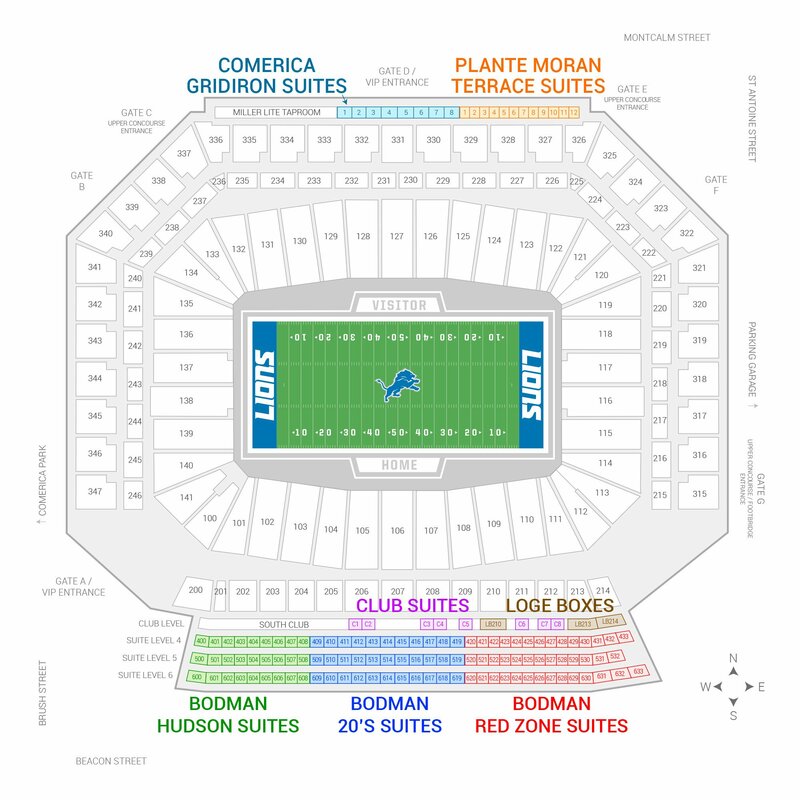 The seating chart below shows where the Detroit Lions suites at Ford Field are located.